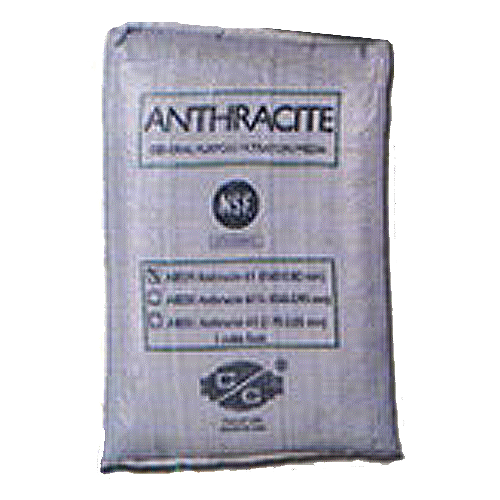 Anthracite is a select coal, mined and processed for use in water filtration. Although its potential for water treatment has been recognized since ancient times, anthracite coal was not used for this purpose until the beginning of the 20th century. Crushed Anthracite makes an excellent medium density filtration media. Anthracite is mined from the finest Pennsylvania coal. It is specifically selected for water treatment, and during its production goes through several sizing inspections. Representative samples are randomly chosen for a complete laboratory quality control analysis for effective size, uniformity coefficient, specific gravity, acid solubility and hardness. Because of its unique density, Anthracite can be used in multi-media filters. At 50 lbs/ft3, it will hydraulically classify and remain above heavier media such as Filter Sand or Manganese Greensand, providing a prefiltration layer. Higher service flows and longer filter runs than equivalent sand filters Close attention to gradation, hardness and purity assures consistent and reliable performance Unique density allows Anthracite to be combined with other filtration media in multi-media filters Lower uniformity coefficient has less oversized and undersized particles resulting in a highly uniform bed. #1.0 Anthracite: 12-18 gpm/sq. ft.
#1.5 Anthracite: 18-25 gpm/sq. ft.